See why preserving the range largely as open space says much about who we are and what we value. Who is NeVar and NeVara? Nevar© and his mate NeVara© are a not so common raven pair. Together, they have become the mascots and narrators for this website. Ravens were chosen for their intelligence, sociability and adaptability. They have been companions to humankind for all of recorded history and are a rich part of our folklore. To some ravens are evil. To others they are revered as noble spirits. 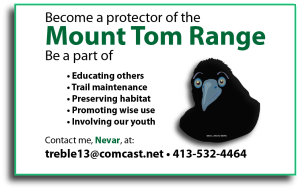 And so ravens were chosen to tell the story of Mount Tom and why the ridge that makes up the spine of Holyoke should be preserved largely as undeveloped open space. Should you have skills in animation, graphic arts, audio and video recording, photography, voice-overs, research, law, and would like to help tell the story of the Mt. Tom Range, please leave a comment under Recent Posts. 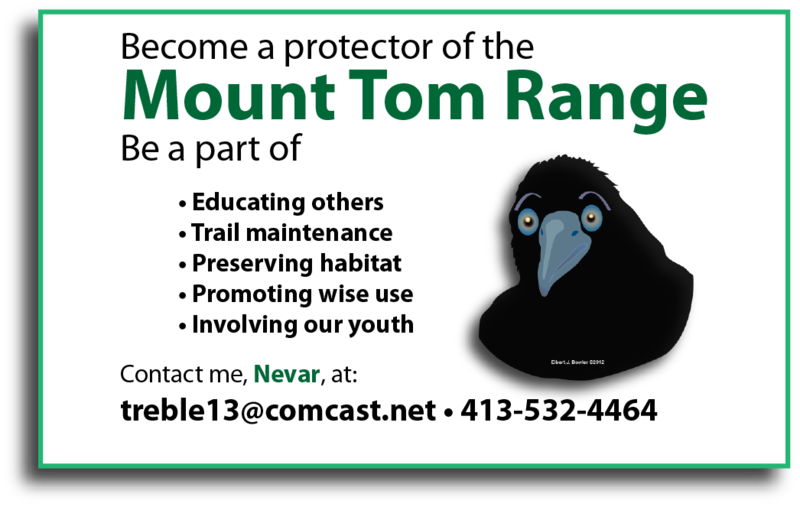 Preserving Mount Tom, the entire range, largely as undeveloped open space is no easy task. It takes lovers of the outdoors, picnickers, those wanting to get away, as well as business interests, policymakers and those who want to have the range for a backyard. If you are one who will find ways to create win-win outcomes that sustain a viable economy while preserving our environment, here is your chance. E-mail my address to all you know and contact me. Let’s start a friends group. Together we will create a voice for Mt. Tom. Please use the Post Page to share comments.